Hey, just thought I'd give a bit of an update with how I've got on here after asking for advice on another thread. Keep in mind I'm very much an amateur and I'm making this up and learning by doing. Anyway I'll give you a brief background/how I ended up here. I've always been able to keep any knives I have had sharp with the following 2x steels - a diamond jewelstik and a descend steel and when things got really bad/fkd, I've got a very cheap norten oilstone. 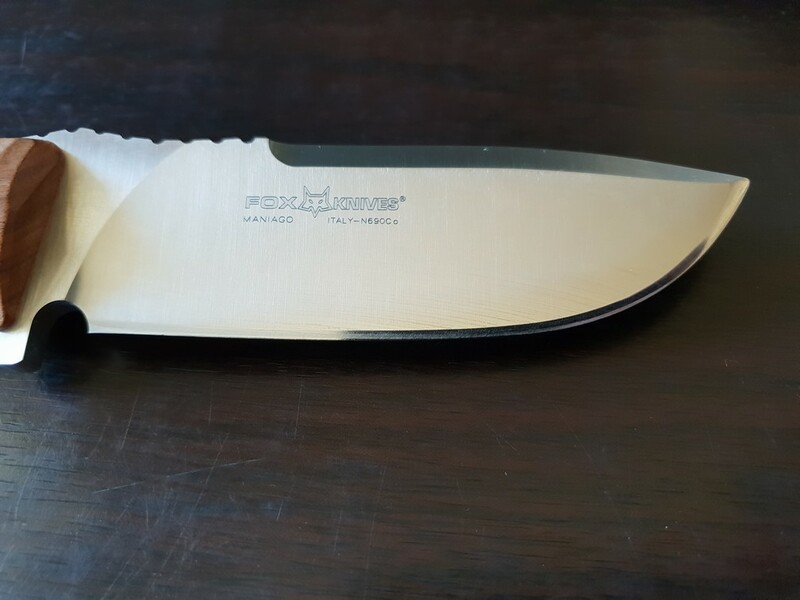 I found my kitchen and cheap hunting knives (like below) were easily maintained/sharpened to sharp enough to shave my arm hair with these two. However with recently acquired higher quality steel these would no longer cut it. After my recent thread and some internal battling I settled on buying a decent 240/1000 grit waterstone and I've got to say I'm impressed. Had a very step grind on it and I found the belly very hard to resharpen. After a good 3/4hr work on the 240 grit, I manged to get what I think I need shape wise - a lot of material came off - particularly near the tip. Then 15-20 mins on the 1000grit to fine it out a bit and I was actually happy with it! However I still found I could get it sharper with the diamond steel and steel though which is what some of the coarser looking marks on the edge are. These definitely helped fine the edge out and got this steel v sharp. I think harder steel responded better to this than the softer steel I originally tried. I'll guess I'll wrap this up. I managed to achieve results without having to spend big $$$ on a scary sharp or the like. Also now that the bulk of the work has been done, hopefully I should only having to maintain instead of resharpen so the time that went into this should be well spent. Big thanks to all that gave advice etc. Last edited by suthy; 22-01-2019 at 08:18 PM. Scouser, Gibo, Damnitchy and 4 others like this. Suthy, You are on the learning journey - well done. Best way to learn is to practice, practice and then practice some more. I recommend that you get a good quality loupe so you can view your edge sharpening close up. A seven power should do. With the steel you have and the diamond stick, you are actually leaving a saw tooth edge. 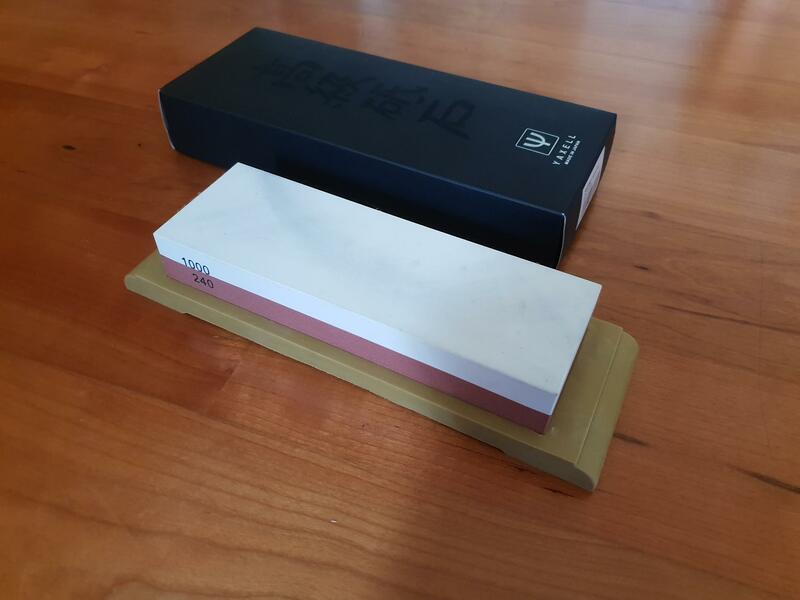 The water stone and strop will leave you with a polished edge. These two don't mix. If you want to use a steel on a stoned edge, you need to use a polished steel, something you don't typically see these days, but you can order them from the butcher suppliers. They are super smooth and are designed to remove the rolled edge, not leave a saw tooth. That said, I have several smooth steels, but a good quality strop will out perform any steel. I recommend you get a quality piece of leather and make a decent strop as per my suggestion in your previous thread. You will be astounded by the difference. As hotbarrels alluded to, steels don't sharpen knives, they just straighten the edge out if it has rolled over on itself. A steel alone won't sharpen a knife, although it will give this impression to the uninitiated. The other option if you can’t find a smooth steel is to take the knife and pull the edge through a piece of hard wood across the grain, this will rip the wire edge off. @hotbarrels I'm working on finding some suitable leather atm. I used the bridle leather just to experiment with in the meantime. My left arm and both thighs are currently hairless so I'd say they've been a success so far!! @tanqueray The diamond steel most certainly does sharpen/cut material off knives and I have found the normal steel does refine the edge a little more, even if it is just straightening a burr. On this note can anyone explain the difference between a diamond steel edge finish and a diamond stone edge finish ie how one is saw toothed and one is polished? Its not the steel versus stone that creates the saw tooth versus polished - its grit size, and to some extent, the nature of the grit doing the cutting (diamonds have sharp angular grains, natural stones tend to be softer and less angular). The larger the grit and the 'sharper' the grit the more saw toothed the edge will be. A finely honed and polished edge will be 'hair popping' sharp and will shave your arm and push cut paper, where as a saw toothed one wont. That said, a saw toothed edge will likely cut course rope for longer, and handle impact with bone better. If you are sharpening to a vee bevel, a saw tooth will work just fine, but on a convex grind, a polished edge will usually work better. Because my wife abuses our chef knives, and I am sick and tired or hand honing the micro chips out of the blades, I now use the linisher with a 400 grit belt and a strop loaded with 800 grit paste. Instead of it taking me 30 minutes to hone a blade on a water stone, it takes me 30 seconds on the linisher, and they will shave your arm and push cut paper. Last edited by hotbarrels; 24-01-2019 at 06:52 PM.